Today we see an increase in the number of women around the world actively taking on leadership roles and advocacy positions to use their voice to speak up for other women. Donetsk Ukraine September 2013. 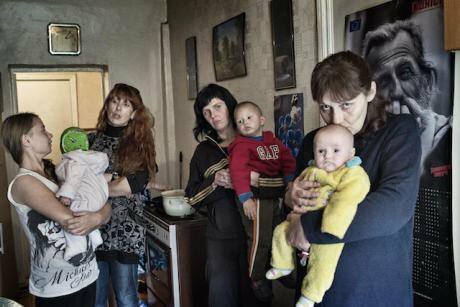 Women and their children at a Light of Hope shelter in Poltava Ukraine.© Yuri Kozyrev/NOOR/Redux.The proliferation of current feminist movements, such as the Women’s March and the viral trend of #MeToo, call attention to the mistreatment of women and other forms of gender inequalities. But there is one particular group of women who you won’t see widely supported at any protest or trending on social media: women in the war on drugs. Routinely silenced by stigma due to their drug use or involvement in drug-related economies, these women face some of the gravest health and human rights violations across the globe. These are the women with few allies, who often have limited or no access to supportive services and have no mainstream platforms to express their experienced injustices. Decades of the war on drugs have imposed countless social, health, and economic costs on women. Many drug policies and programs often overlook or outright ignore necessary women-specific needs such as, providing reproductive health or addressing gender-based violence. These unaddressed needs are further compounded by stigma and criminalization. As a result, drug-related harms among women are often significantly exacerbated. Non-violent drug convictions incarcerate women at higher rates than any other crime worldwide. In many European countries, the average HIV prevalence is 50% higher amongst women who use drugs than it is among men who do the same. In addition, drug-involved women face increased risks of physical and sexual violence, even in criminal justice settings. Similarly, the lack of consideration for women’s needs creates significant barriers in access to treatment or healthcare. On the rare occasion that women are mentioned, it is related to drug use during pregnancy. As a recent prime example, President Trump praised a police officer and his wife for adopting an infant exposed to drugs in the womb at the 2018 State of the Union address. The needs of the biological mother such as housing, treatment, and prenatal care were never even mentioned. For women in similar circumstances, punitive responses such as incarceration and the loss of parental rights are often the only forms of intervention. Supportive services such as healthcare, harm reduction, or treatment are often nonexistent. While extensive measures must be made to lessen the numerous harms imposed on women, leading advocates are making headway by simply starting to include women impacted in the conversation by offering an outlet for them to express their unique perspectives and needs. The early years of the drug policy reform movement was primarily led by men, yet today we are seeing an increase in the number of women around the world actively taking on leadership roles and advocacy positions to use their voice to speak up for other women. A series of provocative photo essays by the Washington Office on Latin America (WOLA), for example, portrays the stories of eight women from Argentina, Bolivia, Colombia, and Costa Rica who represent the alarming rate of women imprisoned in Latin America for minor, non-violent drug offenses. “Many of these women are single mothers, live in poverty, and enter the drug trade out of desperation or coercion. Their incarceration also impacts their children, who are often times left without proper care. When these women leave prison, their criminal record makes it difficult for them to get a job, pushing these women further into a cycle of poverty and desperation,” explained Coletta Youngers, senior fellow at WOLA. In the US, one of the few organizations that recognize the unique risks for pregnant women who use drugs is the National Perinatal Association (NPA). NPA acknowledges that treating perinatal drug use as a crime is counterproductive to maternal and prenatal health. They are also deeply committed to supporting the voices of pregnant people by elevating parents and self-advocates in the public sphere. NPA actively recruits parents with lived experiences to participate in conferences and offers financial scholarships for their dedicated time. “The most important part of NPA’s interdisciplinary efforts are the voices of the parents and families with lived experiences – they are the true experts in understanding the gaps in services and treatment barriers for pregnant people who use drugs,” says Joelle Puccio, Registered Nurse and chair member of the Perinatal Substance Use Program. In Indonesia, the inclusion of women who inject drugs were considered a significant advance in a recent community-based participatory research study. Conducted by the University of Oxford and the Indonesia Drug User Network, the study included more than 700 women who inject drugs. The study’s goal was to better understand the needs and accessibility to services for women who inject drugs. Research findings were used to mobilize and empower drug-using women to play a greater role in advocating for gender-responsive HIV programming and policies. The momentum to support women impacted by the drug war cannot be siloed within the drug policy reform movement. All leading feminists activists groups can offer support by using their existing platforms to challenge injustices and further elevate the advocacy efforts of women impacted by the global war on drugs. Follow Kasia Malinowska on Instagram where she will highlight the voices of other leading women drug policy reformers throughout the month of March.